My massage and bodywork training began with an extensive 1250-hour program at the Boulder College of Massage Therapy in Colorado. A required 4th-semester internship was fulfilled working with the dancers of the Cleo Parker Robinson Dance Company in Denver. I have since taken a wide variety of post-graduate courses and trainings, including Deep Tissue, Neuromuscular Therapy, Sportsmassage, and many others. 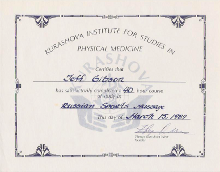 The Sportsmassage trainings enabled me to obtain national certification in that discipline, which qualified me as a Sportsmassage Therapist to work directly with athletes at the Olympics, Goodwill Games, and Boston Marathon. I also worked with U.S.A. Judo at their training facility as the national team prepared for the Olympics and World Championships. I have been in private practice for 25 years, and am honored to work with a variety of wonderful clients. As a volunteer I've offered my massage and bodywork services to patients at California Pacific Medical Center and other health care organizations, and at local sports competitions. For more detailed information, see below. As my work has evolved over the years, a combination of client needs / requests and my own interests has led me to focus most of my work on the core areas of the body, including the low back, pelvis, hips, thighs, and abdomen. The pelvic floor is an important part of the core, as is clear from the information in this website. My core work is detailed and comprehensive, thoroughly engaging all the muscles that comprise this key area. It includes prone (face down), supine (face up), and side-lying work, which allows better access to muscles such as the adductors on the inside of the thigh as well as those on the outside: the IT Band and side muscles of the hip, pelvis, and lower trunk. You can find more information on my other website at coremassage4men.com. A note about my work space: I have a separate room comfortably set up for massage and bodywork purposes. My Colorado Healing Arts table is high quality, extra-wide, has ample padding, and is topped with a fleece pad for extra cushioning. A face cradle gently supports your head and I use 100% cotton flannel sheets and face cradle covers. The room is kept comfortably warm and I will gladly adjust the temperature to your liking (just ask!). Light, relaxing music plays in the background, either from my own collection or, if you prefer, a favorite CD from yours. 4th semester internship with the Cleo Parker Robinson Dance Company in Denver, CO.